Home Office Skills Book-keeping Your VA services are too expensive aren’t they? 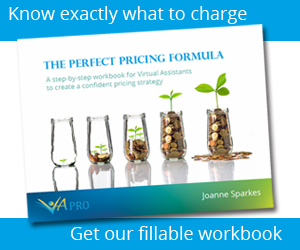 This week a potential client said to me “- you’re expensive, my Accountant says I can get a much cheaper book-keeper”. Should I be worried and fight on price? I don’t think so, and I thought I’d share with you my thoughts on why. I usually welcome this kind of objection when it comes up. Often a client will say this to you, not when they can’t afford it – but when they haven’t yet seen the value in what you’re providing. Your job is then to show them where that value is. The objection can often be overcome by asking them how much time they spend on their administration now and what they will be able to do with the time that you can give them back. Can they use that time for generating more income for themselves, and what’s their hourly rate? can you give them back more time with their family? more sleep? I wonder what kind of book-keeper costs less than me, I wonder if they have the same qualifications, the same experience, the same dedication, the same eye for detail that I can bring on a day to day basis to a business owner. It’s possible that when I started “working from home” I thought I should consider myself lucky that I could work flexibly and should be glad of what was offered – but no longer; I run a business, I have a lot of skills that others just don’t have and I deserve a proper income from it. Have you considered what your particular skills are worth to someone that doesn’t know how to do what you do? You can check the average salary for what you do in many places. One example is Total jobs.com which gives average salaries based on recent job postings with them. I typed in book-keeper and got for the UK an average salary of £25,000 but ranging from £21,000 to £28,000 http://www.totaljobs.com/salary-checker/average-bookkeeper-salary The salary for Personal Assistant is similar. So on paper, given 52 weeks a year, 5 days a week, 7.5 hours a day an average book-keeper costs £12.80 an hour. Crikey I’m expensive! Oh, hold on, I forgot to add Employer’s national insurance. That’s 13.8% on anything over £7488 a year. So we’re now paying our book-keeper £27416.66 in costs of employment. Something else to take in to account is productivity. Typically this is given as 60% and I can vouch for the fact that if I sit at my computer for 7.5 hours then billable time is often around the 5 hour mark. If you’re a VA then clients only pay for the time you’re working for them – not for the trips back and forth to the biscuit tin, the loo and the calls to a friend. If an employer is really unlucky then an employee could be 100% productive at facebook as heard on the news today. So let’s take 5 hours. What’s the hourly productive rate of our average book-keeper now? and that’s before thinking about paying for liability insurance, cost of furniture, computers, software and training which a virtual assistant provides for themselves. So if your client wants someone who’s better than average, and you know they do – go on, put your prices up, because otherwise you may as well go back to doing an average job for an average salary, with none of the hassle and none of the risks. Fantastic article which illustrates very clearly why VA’s are a good option for business support. Thanks Sue, I hope it’s useful. Thanks Claire, I originally did the calculation to prove to myself that around the £25 mark is not outrageous when compared to employing someone. The value we provide to a particular client could well be a lot more than this of course! If VAs stick to a rate that they think clients will pay based on a job advert then at the end of a year they’re likely to wonder why they don’t seem to be making a living. Super article…this is going in my Favourites Bar! Thanks Lisa 🙂 Did you get here on the blog hop for Global VA week? Hope it comes in handy. Do get in touch if there’s anything else you think we should cover. Great article… I sometimes struggle to put it as clearly as this does. Thanks Joanne! Excellent article, Joanne. Thank you! Joanne, excellent article and very clear in terms of the additional costs associated with employees versus freelance. I had the exact conversation yesterday with a prospective client and I was so tempted to cave in and agree to reduce my costs, but I’m glad I didn’t because it completely devalues the strength and quality of service and professionalism that I pride myself on. This is such a reassuring article! I finish my full time job on Friday to run my own VA business after spending 10 years as a PA in London! Great points, well made! Good luck Alice. Wishing you all the best with your new venture! A great article which truly reflects the hidden costs of an average employee that most employers don’t take into account. Coming from a HR background and now running my own VA business, I did a similar blog myself some time ago and it really is an eye-opener for many businesses. Some quick calculations also, as you say, renew our confidence that we are in fact totally worth it. What a fantastic article, Joanne. Thank you for taking the time to detail all that information for us. I currently use the “how much you’re already paying” based on a client’s own hourly rate, but these figures really are very helpful in taking our response a step further.